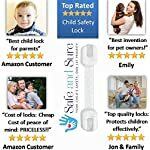 PROTECT YOUR CHILD – These adjustable child safety straps by Safe and Sure will safeguard your infant from harm around the home and give you total peace of mind. 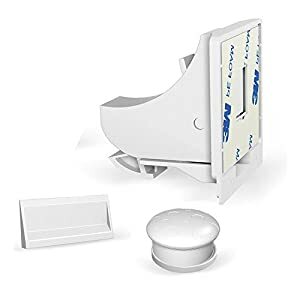 Easy to install with the included 3M Adhesive tapes, these baby proof locks can be applied to cabinets and appliances to prevent injuries and accidents, and stop your child getting their fingers trapped in cupboard doors. MULTIPURPOSE AND REUSABLE – Our patented child safety straps come in a pack of seven and are durable, reusable, and won’t damage surfaces. 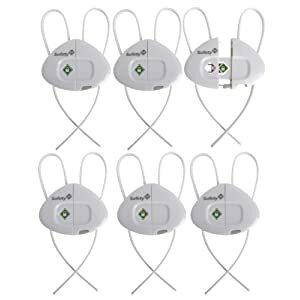 Fully flexible, they can fit around the corners of appliances and are safe for use on electrical goods. 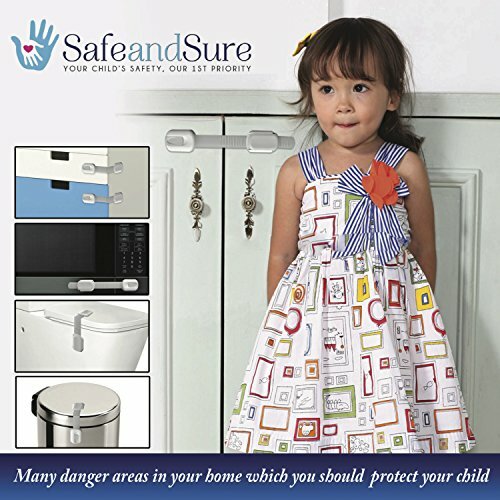 Use our toddler proof latch kit on refrigerators, microwave ovens, cupboard doors, and toilet seats to safeguard against common home hazards. 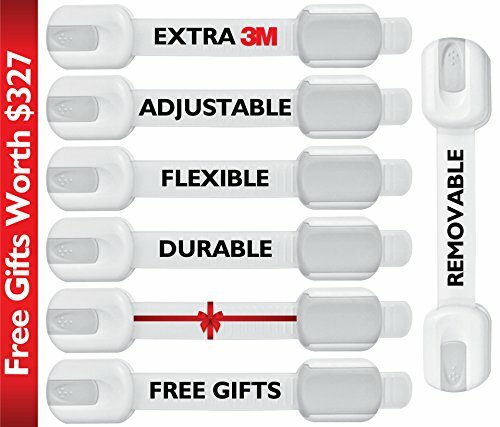 Use our screwless safety straps as an anti-tip latch on light furniture, with no need to drill into walls. 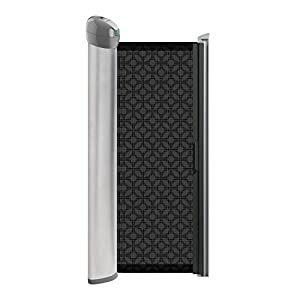 KEEP PETS OUT OF MISCHIEF – Reduce the time you spend clearing up mess and clutter by preventing your dog or cat getting into cupboards with our innovative pet proof cabinet locks. 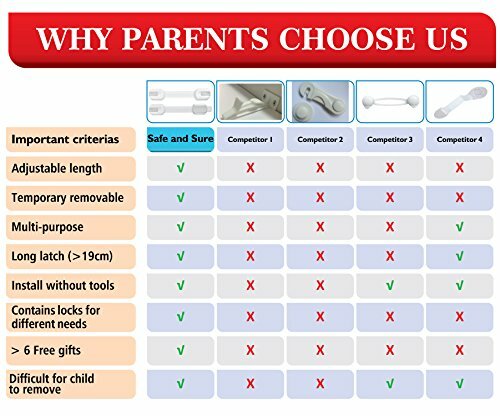 Our premium child safety locks feature buttons which are easy for adults to press but will stop kids and pets in their tracks! Secure your home appliances and furniture and keep your children and pets safe with these adjustable child safety straps from Safe and Sure!Prevent accidents around the home and safeguard your child against common household dangers such as poisonous chemical cleaning products, medications, knives, and guns. 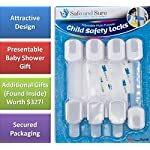 Flexible, reusable, and easy to install, these baby proof locks can be applied to cabinet doors, electrical appliances, and more to give you complete peace of mind whenever your child is left unattended. 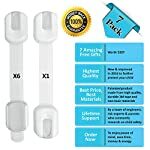 Fix our child safety straps to doors and drawers to prevent little fingers becoming trapped, or attach them to light furniture pieces to secure them to walls and stop children and pets knocking them over. Whether you have an inquisitive toddler or a boisterous pet, our safety locks will keep cabinets tightly fastened shut and stop furniture tipping over without the need for drilling holes and using bolts and screws! 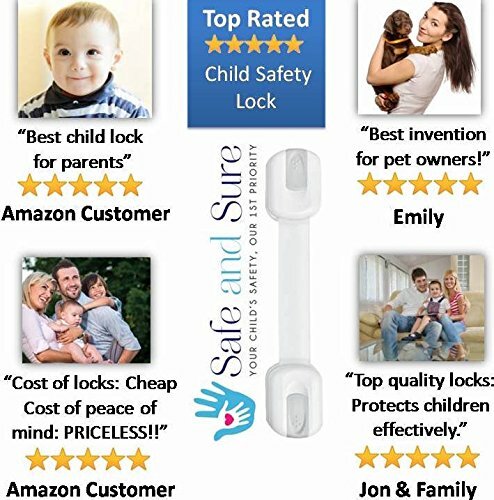 Strongest and most reliable child proof locks available! 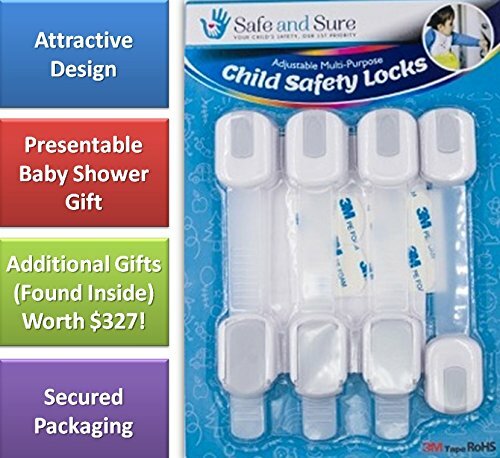 Your number one priority is the safety and protection of your child, so buy Safe and Sure’s child safety straps today with confidence and our 30-day money-back guarantee! 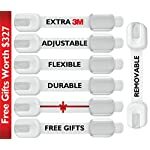 FREE GIFTS WORTH $327! 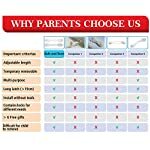 – For a limited time, our child safety straps come with free gifts including a bonus strap and adhesive tapes, 17 parenting eBooks, VIP membership and discounts, child safety information, and fun educational materials! 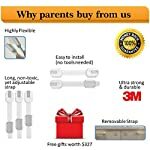 MONEY-BACK GUARANTEE – If you are not completely satisfied with our product simply return it within 30 days for a no questions asked full refund or replacement! Baby Day Shop Copyright © 2019.